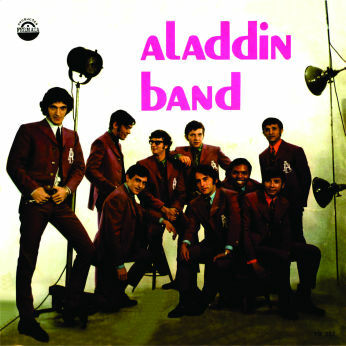 Aladdin Band presented here and today for the first time with their first album after which they have released another one three years later. Their discography counts also several compactos and one EP on CD released last year. I can not tell you much about Aladdin and his band except for their full names and nicks which I copied from the back cover where their portraits (solo and all together) are also displayed. Although I have deliberately omitted it in the list of names and nicknames, I feel obliged to stress the fact that Bill Vogel’s nickname is surprisingly Bill while it is not surprising at all that José Vieira da Silva’s nickname is Zezinho“. Aladdin (ou Aladin, já que usou as 2 grafias em sua carreira) antes de formar a ALADDIN BAND foi o fundador e guitarrista solo do afamado conjunto musical THE JORDANS; e, com ele, gravou 78rpm’s, compactos simples e duplos e 6 LP’s (até 1967). THE JORDANS, nesse período e mesmo posteriormente, também foi banda de apoio instrumental para muitos sucessos musicais de outros artistas, sendo os seus solos inconfundíveis.